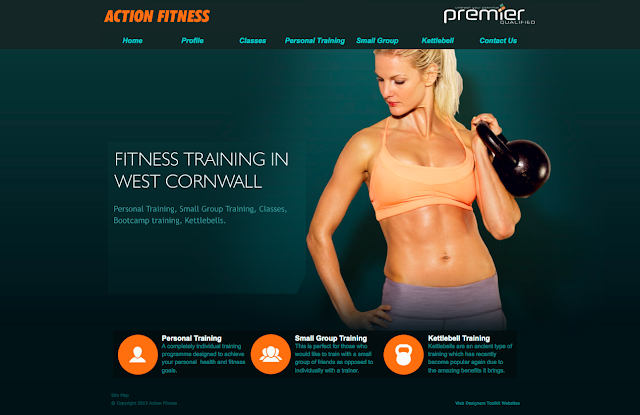 This week's Website of the Week goes to Action Fitness for their editable and update-friendly website with memorable branding. The website is five pages big but the client will be able to easily alter and add to any of those pages with anything they want and have it be a perfect representation of the Action Fitness Brand going forward. The colour scheme, logo and images all add to the branding strength of this attractive site. The first thing you notice about this site is its branding. A combination of a strong colour scheme in a simple layout means that it truly makes an impact and stays with you which is key in circulating the presence of your business and the services you offer on the web. The bright orange text logo stating the name of Action Fitness is extremely brandable and can be easily applied across any and all media and merchandise for promoting purposes. The orange itself brilliantly catches the eye yet compliments the teal green of the background and makes the three homepage icons stand out very handsomely. The Premier Qualified logo was also inventively tweaked by our Design Team to suit this bold theme. The very idea of the orange was brought about by the use of the very striking stock image photo you see as the off-set background. Using stock images and stock image sites such as Shutterstock (the one we prefer for our projects) is a great way to give some life to the design of your website as well as give you some ideas on what you can do with regards to the look, feel and overall tone. Such as in this case, a well chosen stock image of your choice could be the inspiration for your whole brand. "I don't think you could improve on anything, everyone is very helpful." Find out more about Toolkit Websites, Web Designers in Southampton, Hampshire, UK and how they can help your business grow.